It didn't take long before Babs moved in with the Heffners. I guess the rooftop pool was too big temptation. What poor Babs didn't take into account was the fact, that the cooking duty would be passed to her, since other two Heffner couples were moving out the same day. Vera (Amedeo's wife) gladly showed her around the kitchen and prepared her for the worst by pointing at the smoke detector. How sweet of her! Yes, Vera and Amedeo moved out. Vera left the legacy house with a smug face, knowing she would be cooking only for the two of them from now on. What a relief! They moved to a small house in Oasis Springs. Amedeo had the house repaired and remodeled. He knew his wife was used to a certain level of luxury and was a bit worried how would she react seeing the poor state the house was in, when he bought it. It looked much better now. Yet Vera wasn't very happy when they arrived. Amedeo could tell she'd been expecting something much more comfortable. Vera: It's a hovel in a desert, Amedeo. I need my treadmill, I need a pool, I must keep myself in a good shape! And what about our social life? Amedeo: Don't worry, honey. We'll make it work. We can both find a job and we'll have more money in no time. We'll buy you all your favourite stuff again. I promise. Vera: And what about our future kids? I want the best for them. Amedeo: You worry too much. Soon it was Alessando's and Emily's turn to leave the comfy nest. They weren't overly happy about it either. That's the hardest part about being a spare. You have to leave everything and start from a scratch. Alessandro and Emily knew they had each other and as long as it holds, they could achieve anything they set their minds to. They found comfort in each other's arms and it wasn't long before they were expecting their first baby. Meanwhile our heir Andrew didn't waste any time and proposed to Babs. Though uncommital she said yes. They had a beautiful night wedding at the traditional place, where members of their family and friends had been getting married for decades now. Both of them looked gorgeous while saying their vows. Babs has officially become Babs L'Amour-Heffner. Yay! Can't wait for them to have kids and you? Babs was so excited about the wedding that she forgot to take her high-heeled shoes and got married in bunny slippers. How cute is that? At least she felt comfortable the whole time and her feet didn't hurt. Surprisingly, Henry Goth didn't show up at the party this time. I guess he and Susan Caliente-Goth were busy with their kids. Andrew and Babs started working on their own babies. Legacy must continue after all. Soon after the wedding Babs delivered their first baby and was expecting another. Baby-boy was given the name Bao Heffner. With the second baby on its way Andrew started designing and building first two houses, which is part of his generation goal. At the start he wasn't very confident. Building a house seemed a difficult task. But he got a hang of it and was getting better with each house. This is the first one. Let's call it "Bao's house". It's fully furnished and even has an inside pool! Pretty awesome for a starter house, isn't it? I have to tell you a secret: Alessandro and Emily snuck in one night to test the pool (and the bedroom)! I guess they miss having their own pool too much. The house is available for download HERE. By the time the second baby was born to Babs and Andrew, Bao aged up into a child. The second baby was a girl! Yes, first girl in the legacy line! They gave her name Beryl after a precious gem which she is. Andrew build another house. This time thinking of his baby girl all the time. That's why there are so many flowers and the house looks a bit like a dollhouse. It looks really beautiful at night with all the outside lights on. Third baby was born (I know, poor Babs). It was a boy again. Male genes seem to be dominant in this family. They named him Batyr. And our little baby Beryl aged up into a child. She inherited Andrew's black hair and Babs' blue eyes. Can't wait to see her in her teen years! Andrew was once again busy with building a "Batyr house". This time he designed a little more expensive house with a garden. Betyr also aged up into a child soon and currently the are no other babies on the way. 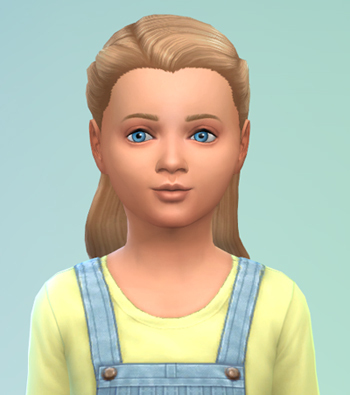 Here are all kids in CAS after a little makeover. Bao is spitting image of his father. He also inherrited his glutton trait. I don't seem to be able to lose it. :) Since the always hungry kid Quido, the founder, this trait keeps showing up. Batyr is an interesting mix of both parents. And the hot.headed trait, oh my. Angry sims are always a handful. This is pretty much all for this update. Though I have a few more pictures in store. Remember Mateo Clark? The teen who was with the Heffners on vacation in Granite Falls? He married a townie and they had three kids. Two girls and a boy. I'm mentioning it because I want to keep the Clarks in the game, since I really loved Alice and Corey. Some of the Clarks will probably keep showing up occassionaly. Here is at least couple of pictures from Mateo's wedding. I already told you that Emily and Alessandro had a girl Ava Heffner. Here's a picture of her. She looks just like her father. No obvious Goth genes so far. Amedeo and Vera had a boy, naming him Paul. 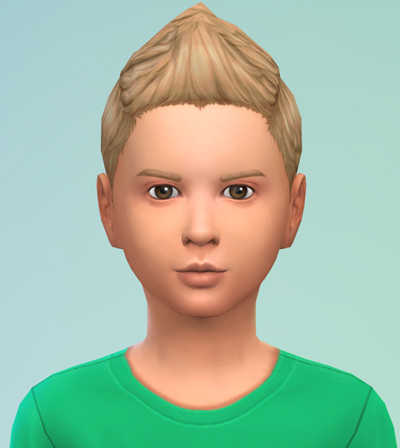 I hope Landgraab genes will show more when he ages up into a teen. Seems he has a Landgraab mouth. I love how he looks. Very cute. And that's all for now. Thank you for reading!